Although one usually thinks of the Crustacea as linked to the insects by the presence of an exoskeleton and compound eyes, there is actually a much greater diversity of eye types in the Crustacea than in the insects or any other invertebrate group. The copepods, for example, have no compound eyes, but a single tripartite nauplius eye. In most this is a simple structure with little in the way of optics, but in one or two groups it has developed into separate eyes equipped with complex optical systems. In the pontellids the eyes are sexually dimorphic, the males having the more complex optics, and even though the eyes contain only 6 receptors it is clear that they are used to identify the females. Nauplius eyes are present in other groups too, but the only other occasion that they attain any size is in the deep-sea ostracod, Gigantocypris, where the eye’s optical system is based on two huge parabolic mirrors. The advantage here seems to be that the light gathering power is very great, in an almost lightless environment. Apart from the copepods most groups have compound eyes of one sort or another. In the malacostraca: the isopods, amphipods, stomatopods and brachyuran crabs all have apposition eyes that are basically similar in design to those of diurnal insects, in which each lens forms a small inverted image immediately behind it. 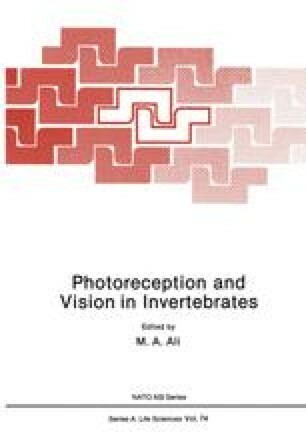 Since these are mainly aquatic animals, the corneal surface contributes little or nothing to the refracting power, and the lenses tend to be variants of the Exner “lens cylinder” in which the rays are focussed by inhomogeneities within the lens itself. Of the apposition eyes the most bizarre are found in deep-sea amphipods, many of which have double eyes and some, like Phronima have wide (10 μm) light guides up to 5 mm long joining the lens to the rhabdom. Superposition eyes, in which the optical array forms a single erect image as in firefly and moth eyes, are found in 3 malacostracan groups: the mysids, euphausiids (krill) and the macrurous decapods (shrimps, crayfish and lobsters). The former two groups, however, use refracting optics to produce the image while the decapods use an array of radially arranged mirrors instead. It is characteristic of the latter type of eye that the corneal facets are square, because the optical mechanism requires the mirrors to act in pairs at 90° (corner reflectors) and this makes it easy to tell the two types of superposition eye apart. It looks as though the fundamental difference between these two types of eye may shed some light on the origins of the different malacostracan groups. (My view is that it was right before 1880 but has got worse since). Physiologically and morphologically crustacean compound eyes are not very dissimilar from those of insects, and this holds for the visual nervous system too, which has the same layout. Does this mean that there is only one sensible way of designing compound eyes and their neural backup, or should we be looking for common ancestors?